Thread: 2018 GIJoeCon: 3 3/4" Box Artwork Preview! 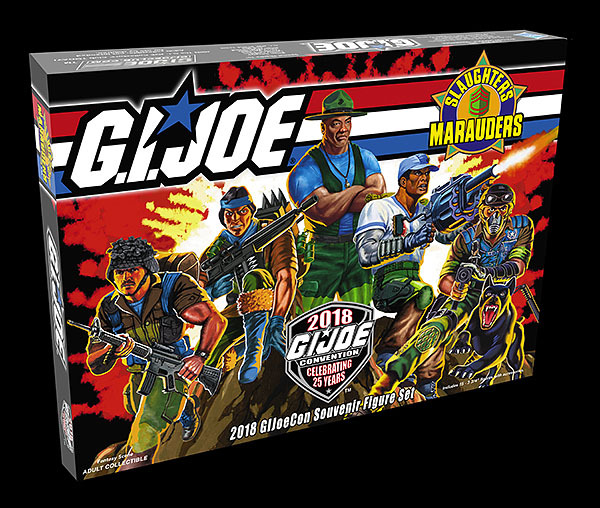 Here is a preview of the box artwork for our 3 3/4" GIJoeCon 2018 Boxed Figure Set! It features the full Slaughter's Marauders unit on display: Sgt. Smasher takes the squad leader position with his highly specialized soldiers for a fast attack, ground assault into enemy territory to combat the devious COBRA forces of Python Patrol in this limited edition 15-figure convention exclusive set. Visit the official 2018 GIJoeCon.com website for all the exciting figure previews! Now this looks awesome!!!! I'm getting more and more excited!!!!!!! Can't wait to get to The Volunteer State!!!! Glad I'm getting the boxed and a loose bagged set!!!!! Last edited by lindy101_98@yahoo.com; 05-15-2018 at 04:00 PM. Looks spectacular!!!! The countdown is on in our house!!! The kids have the days numbered on the calendar. Great artwork. Not quite the direction I thought this would go. This look amazing. I love it so much better than just a logo. Did anyone else catch this about the FULL unit? I just did today as I was rereading. To me this means no more figures in Slaughter Marauders colors. Maybe we will get some highly requested unproduced figures. That would be awesome!! I just reread the description and I didn't see anything about FULL UNIT. I did see where Sgt Smasher chooses the members of the rescue team. Last edited by skoor.cr@gmail.com; 05-17-2018 at 02:25 PM.